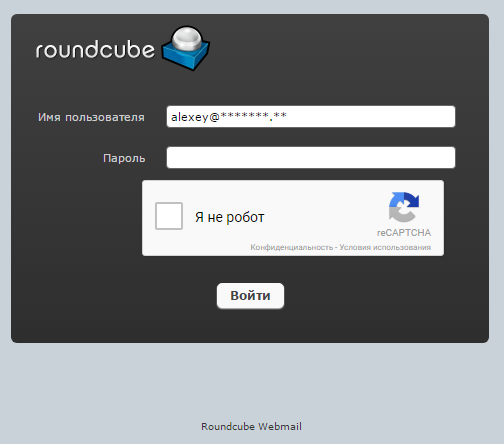 Protect Roundcube with Google reCaptcha - S.A.I.C. Technology s.r.l. reCaptcha plugin for Roundcube is a good way to protect your server against brute-force attacks on a webmail. We will install it from the plugin’s repository https://github.com/dsoares/rcguard.git. The addon was tested at the moment of the writing of this guide with RoundCube version 1.3.3. First make sure you’ve got git installed on your server. If it’s missing you can install it either from your OS repository with a package manager or from sources. remote: Counting objects: 470, done. Receiving objects: 100% (470/470), 82.68 KiB, done. Resolving deltas: 100% (240/240), done. If you see an error you should read everything carefully and try to resolve it. Please feel free to contact us if anything goes wrong here. Go to https://www.google.com/recaptcha/admin and get your keys. It’s important to mention, that Google will show reCaptcha only on domains which were registered at Google for these particular pair of keys. It means that you should either register all of your domains at Google if you want to access RoundCube on users’ domains, or use one domain (or hostname) for all users and register one domain at Google. As soon as you get your keys you should add them into configuration file of the addon. For security reasons some symbols are masked here, in your case there should not be asterisks. if you want reCaptcha to be shown after the first failed login (the default is 5). Or use phpMyAdmin interface and choose DB with name da_roundcube. Now we need to modify RoundCube main configuration in order to let it work with the addon/plugin. Don’t forget to add a comma in the end of the line. Every time when you update a version of RoundCube with Directadmin you will still have the plugin enabled.